The ID @ Xbox Event Thursday evening before PAX was a free and open to the public event located on Campus 92 (aka one of the MANY buildings on the Microsoft campus) just outside of Seattle at MS headquarters. The feature of the event, 50 different independent games coming to, or already available on Xbox/Windows platforms. Developers got the opportunity to show off their games to a wide array of fans and gamers alike in a much more reserved setting than the PAX showfloor itself. It wouldn’t be Microsoft to not up the ante just a little bit, so aside from the 50 indie games, Halo 5 Guardians was also playable at the event, featuring Halo 5 Arena Multiplayer. This was apparently the first time this particular game mode was made available to the public, and when I arrived at the event there was already a lengthy line of people waiting to play Halo 5. There was an equally awesome presence in the two large rooms set aside for all the indies, and a lot of people waiting in line to play them. There were people just hanging out and observing the different games, talking to the devs (many of which who were on standby to talk about their games), and just having a good time. These events further show how successful indie games can be when given proper highlight. Pair an indie event with one big feature (namely the Halo 5 demo) and you get a big turnout. You exited the Halo 5 demo right into one big section of indie games, and it wasn’t like people played Halo and left. Many people then floated around to check out the games, many of which featured couch co-op gameplay. The competition was fierce at some games, hearing cries of success or failure as I assume someone got beaten or won at a particular game. All in all, great support by Microsoft for the indies, and a great event for the general public to check out that might not have had access to PAX. 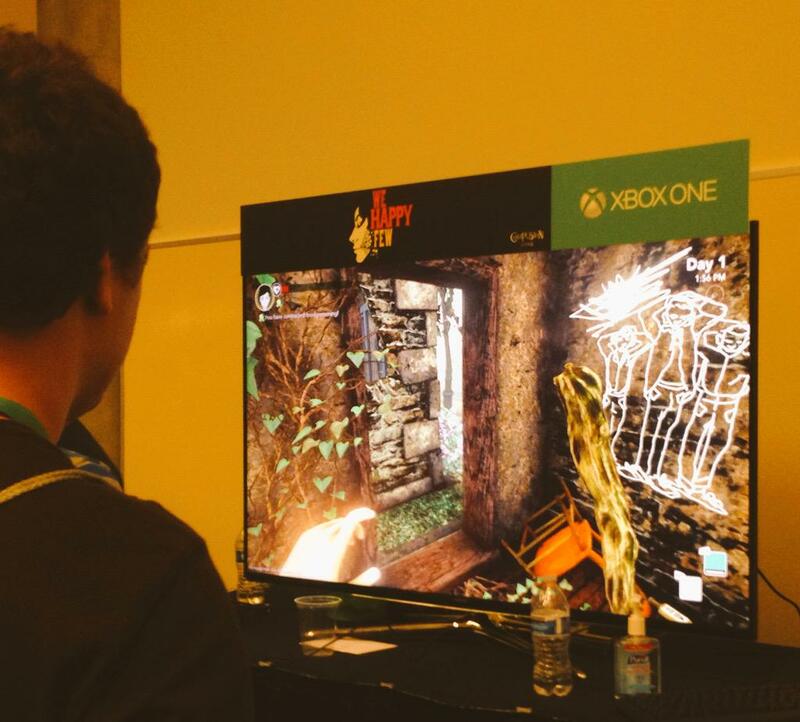 Highlight: We Happy Few, Compulsion Games newest IP (they did Contrast) was playable on what appeared to be an Xbox One console. I’m really excited to see the progress this game has made since the alpha testing I’d done on it, as I’m more excited to play this on console than on PC. Nice work Microsoft. Well done.